The independent American developer, manufacturer and seller of medical devices was forced to realize an expansion because of success. 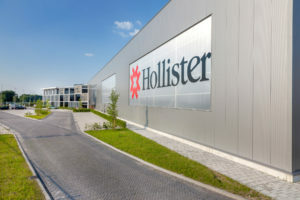 Hollister chose to build a new European Distribution Center in Oud Gastel, which has three times the capacity of its former facility in Etten-Leur. For the intralogistics part of this more than 30,000 m2 warehouse, Inther has been responsible for the installation of the Inther LC Warehouse Control System and the associated hardware, including print & apply- and box erecting machines, all connected by conveyor systems. Inther has distributed the entire system over both the ground floor and the 3,560 m2 mezzanine. The space is thus arranged as efficiently as possible so that the intended productivity and possible expansion can be achieved. In February, the first customer shipments were realized from the new facility. The entire distribution center has been operational since April. On Friday, 25 May, the official opening of the European Distribution Center took place.